Belmont, Geelong – our spiritual home | Geelong Family History Group Inc.
← Back when it began … 1981 ! The Belmont Library meeting room has been the venue for Geelong Family History Group meetings since August 2013 – long enough for us to call it our ‘spiritual’ home. Technically the library is on High Street however most of us use the car park on the southern side off Roslyn Road. Interestingly, this early map of the Township of Belmont n.d. [Wynd Collection] didn’t mention either High Street or Roslyn Road. Back then, both were called Government Road. 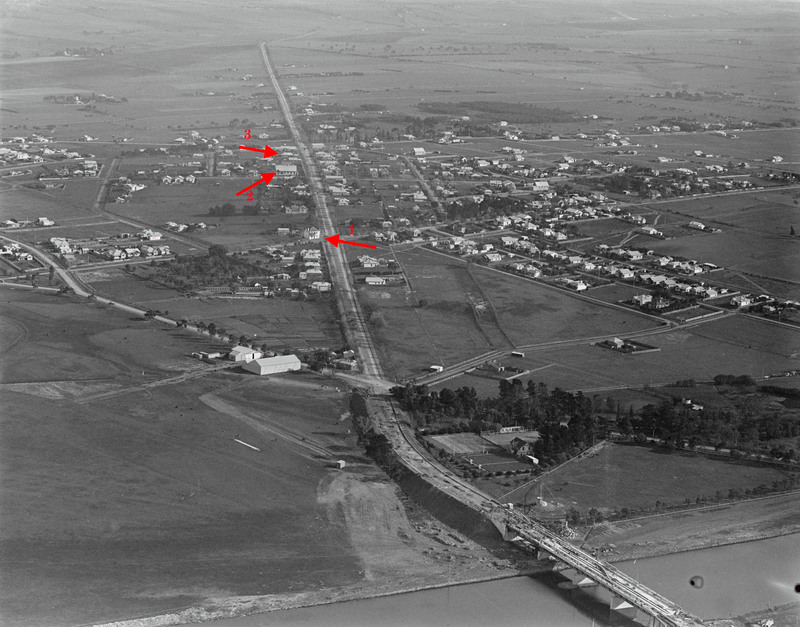 Present day High Stret had additional notations showing ‘From Colac’ at the southern end and ‘To Geelong’ at the northern end. Other Government Roads became Thomson Street and Mount Pleasant Road. 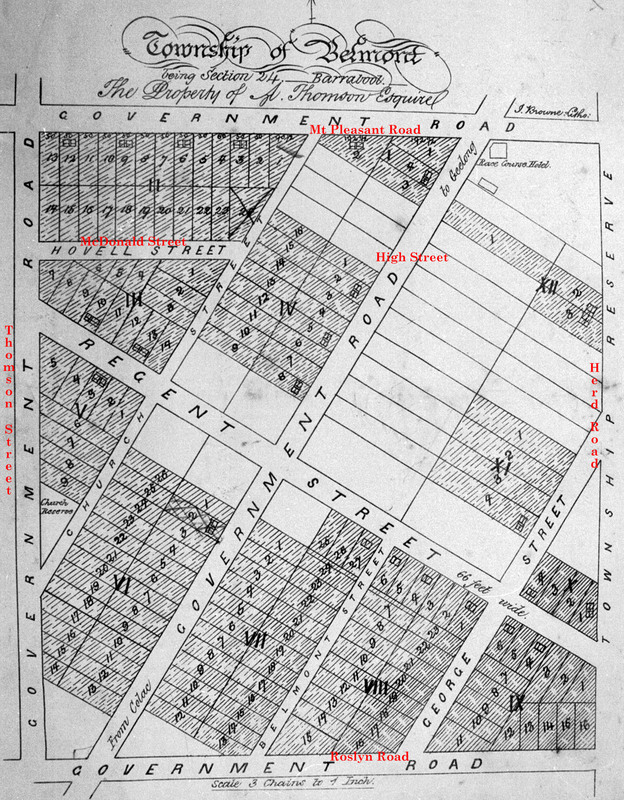 Township Reserve became Herd Road and Hovell Street was renamed McDonald Street. The present Belmont Library was opened in 1982 following a temporary relocation to Regent Street during demolition and building. Their previous building had been on the High Street site since 1957 and prior to that the Library was on Mount Pleasant Road with the old South Barwon Shire Offices. J B HUTTON, being instructed by the proprietor of the above very valuable Fee-simple Properties, DR THOMSON M.L.C., has much pleasure in announcing that a Sale by Auction will take place on the 16th Instant, on the Grounds, when a sumptuous entertainment will be provided for the occasion. The Township of Belmont is on that beautiful rising ground after crossing the Barwon at South Geelong, just above Kardinia, and all the New Houses erected thereon (about 24 in number, and now to be sold), are on good sized allotments of Ground; and the situtaion for health, comfort, and convenience, being less than one mile out of Geelong, is not to be surpassed. This aerial photograph, c.1926, taken by Charles Daniel Pratt not only shows Belmont with High Street running from north to south but also his aerodrome and strip at the lower left hand side of the photograph. This entry was posted in GFHG Web Site, Images, Local History and tagged Belmont, Belmont Library, Geelong Family History Group, GFHG, Library. Bookmark the permalink. This is very interesting, having lived and worked at Kardinia for a good number of years I have interest in Dr A Thomson. I knew that he had established the Belmont Estate but had knot known what area was involved. I was just a little disappointed in the photo as it missed showing Kardinia by a few yards. Still it is a great photo showing the development at the time the bridge was being built. There are heaps of aerial photos to choose from – go to http://slv.vic.gov.au and search for PRATT and/or AIRSPY – select the digital online ones and be prepared to lose a day or more going through them! Enjoy!